Using natural stone like quartz, marble and granite can be used to create a showstopping design feature called waterfall edges. Waterfall ends to kitchen worktops are really popular at the moment. If you don't know what we are talking about it is when the kitchen bench top is extended at the end, sometimes, all the way to the floor and over the side panels of your kitchen cupboards. This sleek look can really showcase your kitchen as well as protecting your kitchen cabinets. This is especially important as the edges of the cabinet is one of the first places you see wear and tear, so a waterfall edge could extend the life of your kitchen. There are no harsh edges to catch yourself on either. These work particularly well on kitchen islands, in larger kitchens where you may want to showcase the space and design and in smaller kitchens to make a feature area. Waterfall edges can be on one or both sides of the kitchen worktop. It is entirely down to you. However, the waterfall edge does increase the cost of the natural stone kitchen worktop, so this should be taken into consideration. The waterfall kitchen countertop edge creates a really modern look to a kitchen and is a design that looks like it is here to stay, as it has become more and more popular in kitchen refurbishments and redesigns. 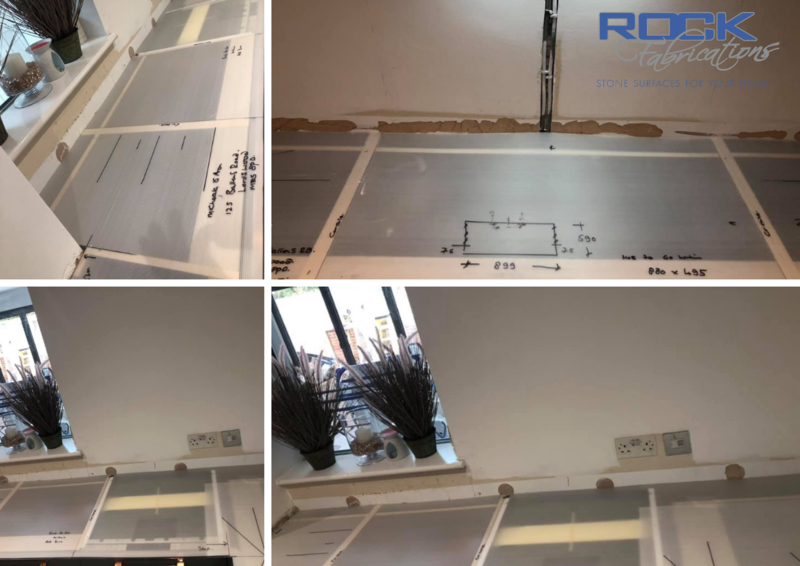 These photos are of us templating a kitchen in Chatham, Kent, ready to install a quartz worktop and looking forward to sharing the finished results. Should you choose quartz for your kitchen countertop?